Events like trade fairs or a conference are the important tool for strategic marketing and communication used by companies of every size. Event Organizers constantly look for innovative ways to display the products, invite inspiring speakers for conferences, or include exciting facts to create a unique memorable environment. But in an increasingly digital world, what can you do to add more spice to the exciting experience? Technological advancements can be at the heart of creating a memorable and interactive event. 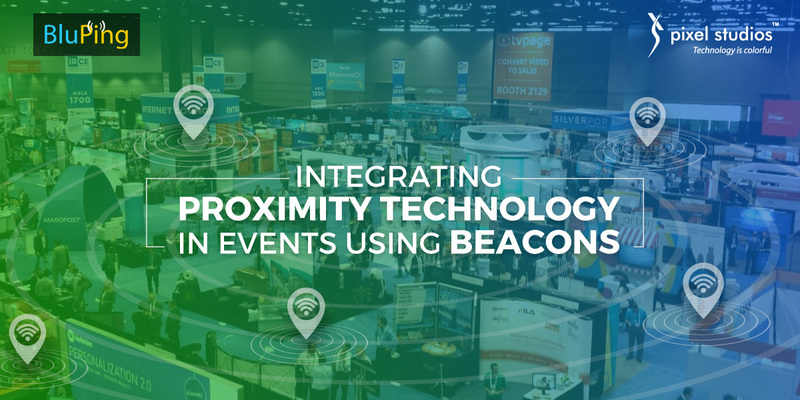 Real-Time Location Services (RTLS) and Proximity Technologies using Beacons can give users a more engaging experience when attending your event. Beacon is a Bluetooth radio transmitting device, which is compact, inexpensive and powered by a battery. Apple was the first to introduce Beacon Technology in 2013. Even Google has its own version, Eddystone. 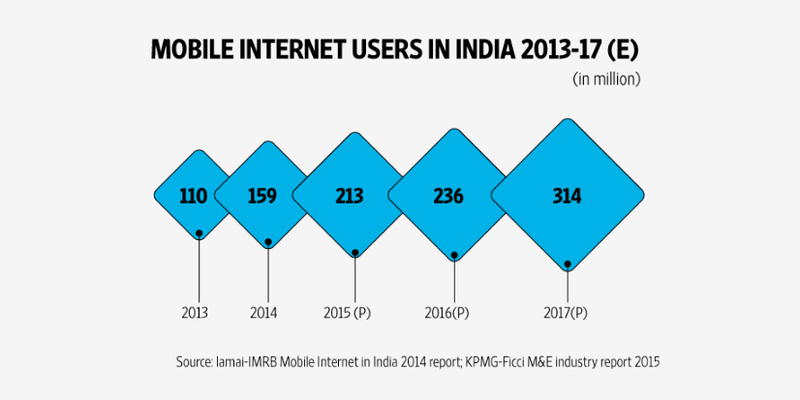 The number of mobile Internet users in India is projected to double and cross the 300 million by 2017, according to a report by Internet and Mobile Association of India (IAMAI) and consultancy firm KPMG. India’s app usage grew around 43% YoY and the time spent on social apps has grown by 52% as per a study by Yahoo’s Flurry Analytics. Studies have shown that a user has 29 apps installed on their Smartphone, and the rate of installed apps is higher than uninstalled apps, per month. Data reveals that users on an average install 8 new apps, while they uninstall 7 apps every month. Event professionals can leverage this growth in adoption and build event-specific apps and use social media to promote the event and its sponsors to a very large audience and invite them. People interested to attend can let their intent know through social media or book tickets through event-specific apps or a myriad of other options can be developed. There are a lot of ways to highlight sponsors offline, too. Let’s explore how this technology can innovative and make the event memorable! E-commerce has almost eliminated the queues for purchasing tickets for movies, airlines etc. What if events could remove the pain of standing in queues to purchase tickets or registering for an event!! In the US, the major leagues like NBA, NFL, NHL etc. loose close to $1 billion in yearly revenue from unsold tickets alone! The major league teams are using proximity technologies to improve the fan engagement and loyalty. 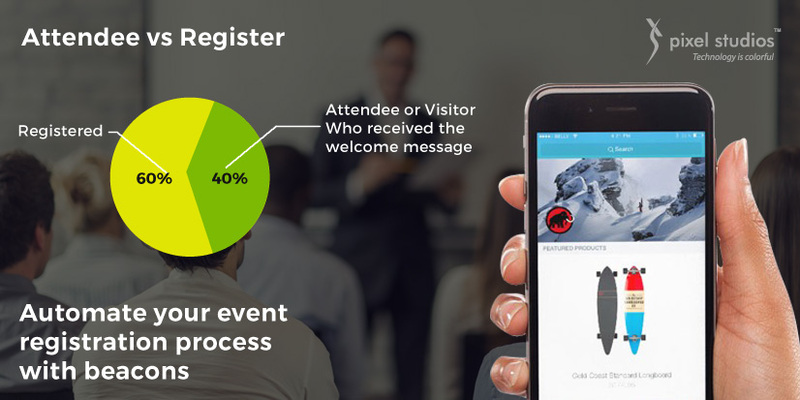 Beacon Technology with mobile apps is being used for frustration-free entry or registration to an event. Beacon technology or RFID is a boon for crowd management. 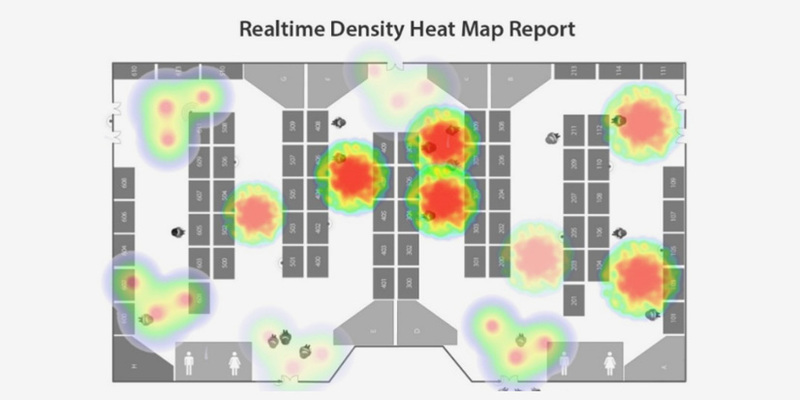 Real-time heat maps can be generated which will help you to get feeds of crowd gathering, movement of participants in an event and proactively inform the visitors about an important event. Let’s consider a use case where you would want to warn attendees about an overcrowded zone or co-ordinate traffic during show-times by reminding the attendees. Pixel Studios was approached by an IT Services and Outsourcing organization which wanted to showcase proximity and indoor location solutions for one of its events. 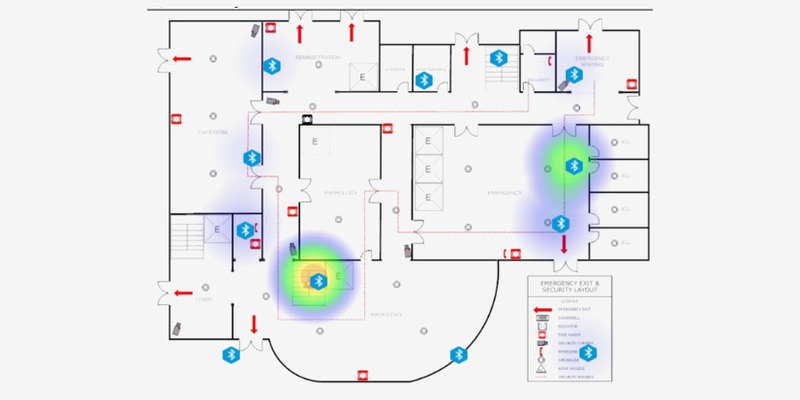 Pixel Studios deployed Beacons and gateways to generate a real-time “Location-specific density reports” of the floor plan (sample shown below). Large events can be overwhelming for the visitors or attendees and what if the stall owner decides to give a 20% discount on all his organic healthcare products for the next one hour. How do the people near the stall or passing the stall would know about the offer? Or, the Amphitheatre was hosting a presentation what your visitors would have loved to join but didn’t know about it. 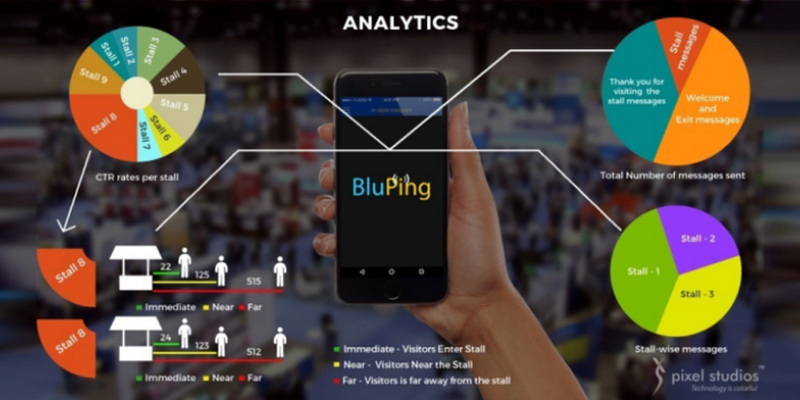 Beacon technology combined with mobile apps will help the event organizers to notify people about what comes next in the venue and access what’s available right when it matters. 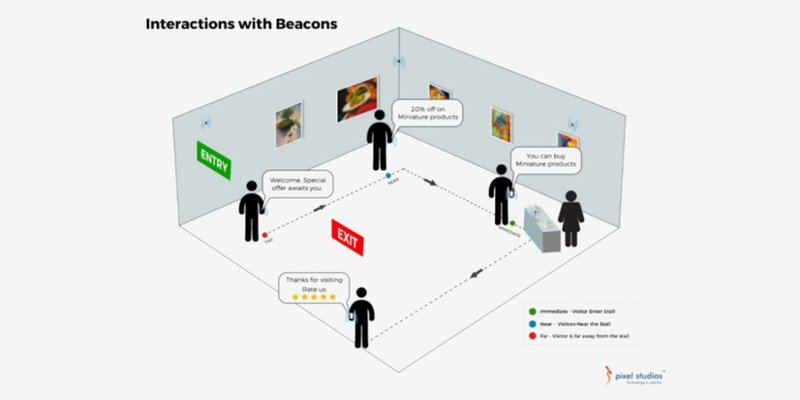 Let’s see how beacon technology implementation helps to enhance engagement in an event. 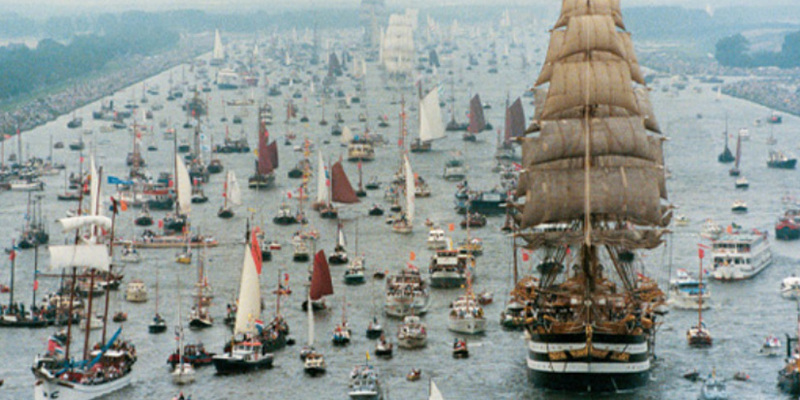 SAIL Amsterdam is the largest public event in the Netherlands and the most important nautical event in the world. The 2015 edition of SAIL Amsterdam was attended by 2.3 million visitors over a period of 5 days. To improve visitor engagement and experience, SAIL used Beacon Technology. This technology enabled the SAIL organizers to send right information about the ship to the visitors when they came near a ship. The organizers were also able to send the visitors information about SAIL merchandise which increased the footfall to the stores by about 50%. In total over 71k messages were sent out with more than 70% information about the ships and around 27% of the messages were opened immediately. SAIL organizers through Beacon Technology were able to analyze 8.6 million visitor interactions. Let’s take another look at the Mobile World Congress (MWC) 2016, around 101,000 attendees gathered and almost 40 million data points were analyzed during the event. The attendees received personalized notifications and benefitted by a machine-learning recommendation system. Moreover, exhibitors were able to connect with attendees and bring them to their stands. Finally, location and audience analytics provided event organizers with the necessary knowledge to improve future events. Recently, Pixel Studios was approached by a firm specializing in investments from Malaysia, to automate the registration process for an event. The event is an annual event and is attended by more than 500+ corporate leaders and policymakers. The organizers wanted to focus on the comfort of the dignitaries rather than on operational issues like registration, guest flow etc. Pixel Studios used Beacon Technology, automated the registration process and developed real-time heat-maps to monitor the guest flow and occupancy. Analytics was developed to provide data about guest’s dwell time in the event and attendance of a discussion or talk. Pixel Studios has successfully implemented Beacon Technology in events in South Asian countries. The enthusiasm displayed by the visitors and the organizers who experienced the technology in action is surely an indication of the shape of things to come. Pixel Studios has a ready-to-deploy platform, with customization options to implement such technology in events of any size and nature.